A group of researchers sponsored by Galderma, a subsidiary of Nestle, have published the results of a series of experiments looking at the effect that Adapalene had on the prevention and treatment of atrophic scarring as well as acne. 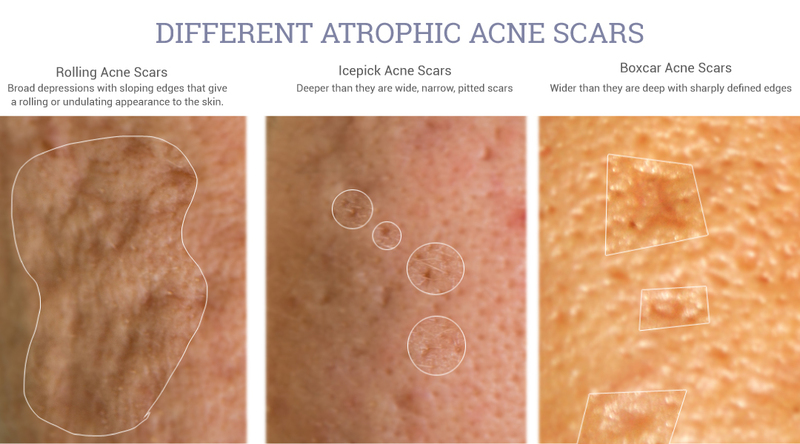 Atrophic scarring is caused by a loss of tissue, so they can appear as sunken areas in the skin or even as holes, commonly referred to as ‘ice pick’ scars. There were three experiments in total, a pilot study with 20 participants that compared Adapalene 0.3% gel compared to a control vehicle, another pilot study with 31 participants comparing Adapalene 0.1% and Benzoyl Peroxide 2.5% gel with a control vehicle, and a larger study with 54 participants comparing Adapalene 0.3% and Benzoyl Peroxide 2.5% gel with a control vehicle. All three experiments were pre-registered on ClinicalTrials.gov which helps reduce reporting bias. Often there is no incentive or reason to report on data from an experiment if there is no effect. I’m going to focus on the latter paper as it has the most statistical power (> 80%) and the most clinically relevant results. 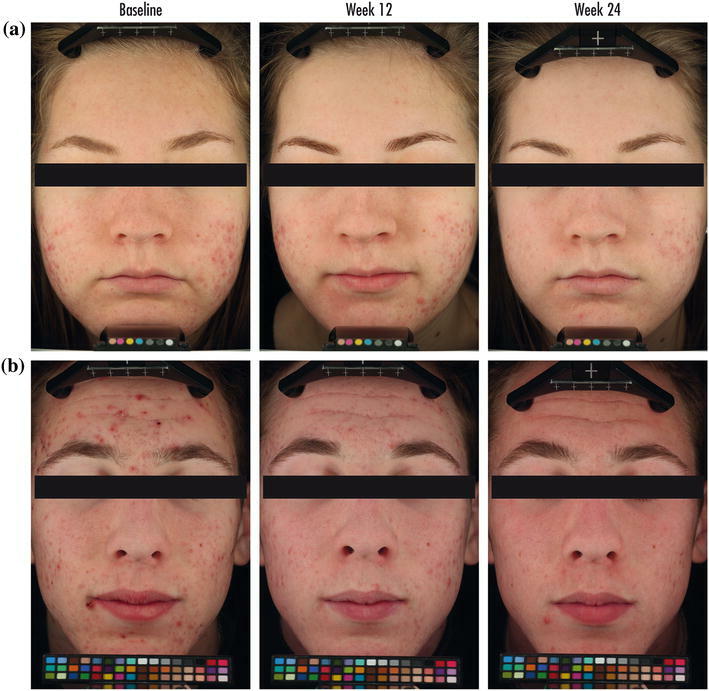 In brief, the experiment using Adapalene 0.1% with Benzoyl Peroxide 2.5% gel showed no change in the amount of atrophic scarring after 6 months of treatment, but people using the vehicle control saw an increase in scars (about 2 more scars after 6 months). In the pilot study with Adapalene 0.3%, participants and investigators saw an improvement in scarring assessments at Week 1 and Week 24. All three studies found a clinically relevant and statistically significant reduction in acne lesions for those using any Adapalene based gels. With the Adapalene 0.3% with Benzoyl Peroxide 2.5% gel study, there was a statistically significant improvement in the scar assessment as early as Week 1. By the end of the experiment at Week 25, there was a 15.5% decrease in a validated scar assessment scale – this worked out to about a mean decrease of 2 acne scars per half of the face. Participants applied the Adapalene gel to only half of the face and the vehicle control on the other half, the researchers believe that if participants had applied the Adapalene gel to the whole face, there would be a decrease of a mean of about 4 acne scars for the entire face. For the vehicle control side that contained no Adapalene, participants saw an increase of about 1.5 acne scars at the end of 24 weeks. In terms of non-validated assessments, the amount of patients who responded to “How visible are the indents or holes to you?” with “A little visible” increased from 37.5% at Week 1 to 62.1% at Week 24. Because some atrophic scarring can resolve on its own, the researchers believed the decrease in scarring with the Adapalene 0.3% and Benzoyl Peroxide 2.5% gel could be due to an increase in the speed of this resolution. For older scars, they believe that the Adapalene gel could be due to remodelling the dermis of the skin (possibly through stimulation of procollagen), improving their appearance. Another factor would be the reduction in inflammatory acne lesions which could lead to new atrophic scarring formation. In the US, Adapalene is now available over-the-counter as Differin with Adapalene at 0.1%. If you have moderate-to-severe acne with atrophic scarring you may consider speaking to your doctor and getting a prescription for the stronger 0.3%. In terms of other retinoids, the researchers point out that there isn’t much research on topical use and improvement in atrophic scarring. For tretinoin I did find two studies, but they included other interventions in combination with the tretinoin. One used iontophoresis to enhance the penetration of tretinoin, and another used tretinoin in combination with microneedling. Both studies found improvement in atrophic scarring. Adapalene and other retinoids activate some of the same receptors, and since topical use of tretinoin has shown to increase procollagen as well, it’s likely that it will provide improvement on atrophic scarring as well.